#1 Vernon Hills and #2 Belvidere North came in as the overwhelming best teams in the class Whether it was on paper or in real time. That did not change once 12:30p rolled around and the results began to pour in. #2 Belvidere North won their second title in three years with a score of 113 points to easily defeat the Cougars who scored 148. From the onset of the race, it was very easy to notice something here. The Blue Thunder had its clutch running juniors Gianna Sagona and Madison Diercks upfront in the top 10 by the first mile. They would hold their positions all the way through taking sixth and seventh places respectively with times of 17:19 and 17:30. All three trophies went to the teams from the Woodstock North Sectional. That third team? Crystal Lake (Prairie Ridge) proved a tough foe all year long gaining respect each week. The Wolves earned their first trophy scoring 219 points. Grayslake Central took eighth and Crystal Lake South which was also from the Woodstock North Sectional finished 15th. This proves they were the overwhelming top sectional in the state on paper and on foot. As expected the two favorites Lianna Surtz and Brooke Stromsland of Lake Villa Lakes duked it out for the title. Surtz, a freshman sensation from Lakes, came into championship hot as a firecracker. She did not waste any time in setting a fast pace that took the leaders through the first mile in 5:22. Stromsland was able to stay poised throughout the three-mile affair and finally pulled away for the victory 16:32-16:35. Chicago (Latin) teammates Marianne Mihas and Ava Parekh took third and fourth with personal bests 17:04 and 17:08. They took the fight out hard before humbling settling in. 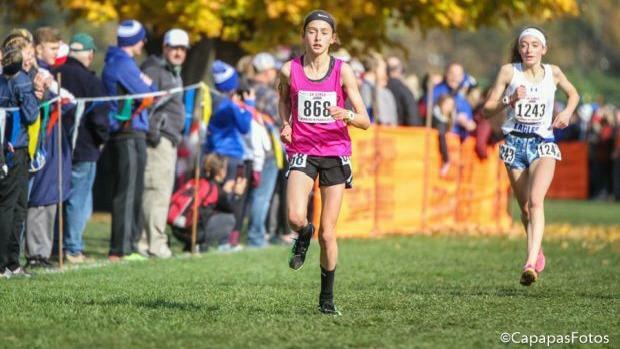 Defending champion senior Jenna Schwartz of Waterloo placed fifth in a season-best 17:14. Schwartz gave it her all working to catch up from the torrid pace. She got as high as third place in the race.